Pharmacology is one of the most important subject in the Pharmacy profession as well as in medical field. Pharmacology is the corner stone of the modern pharmacy. 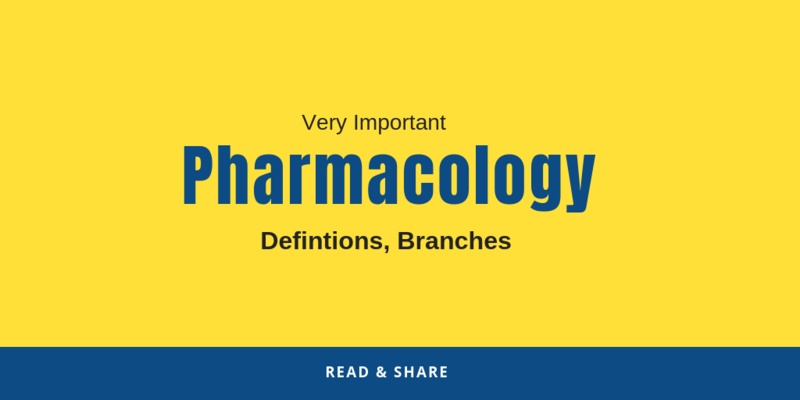 The word pharmacology is derived from two Greek words, pharmacon meaning a “drug” and logos meaning “a reason”. Pharmacology is the study of how medicinal substances interact with living systems. Pharmacology is The study of drugs, their nature, their sources,and their properties,absorption,distribution,biotransformation,elimination,interactions,toxicology and their therapeutic applications. Pharmacology is the study of the body’s reaction to drugs. Pharmacology is study of Pharmacokinetics and Pharmacodynamics of a drug. In a broader sense, Pharmacology looks at how drugs work (mechanism), their side effects and interaction with other drugs. A drug is any chemical entity that causes a change in biological function in a living organism.some drugs are formed inside the body such as insulin and noradrenaline etc.drugs that are introduced into the body from outside are called Xenobiotics. Pharmacokinetics refers to the movement of drugs inside, through and on the body. The nature of an individual’s response to a particular drug depends on the intrinsic pharmacological properties of the drug at its site of action. Pharmacokinetics investigates how the body absorbs, metabolizes and excretes drugs. A drug can be administered orally, parenterally (for example, by injection) or intravenously. The kidney is the main organ that filters drugs out of the body, but also the lungs and sweat glands play a minor role. The rate and extent of drug absorption. The rate of excretion of the drug from the body. Pharmacodynamics is defined as the body’s response to the drug. It refers to the relationship between the concentration of the drug at the site of action and any resulting effect, namely the intensity and the time course of the effect and the side effects. Pharmacodynamics is influenced by receptor binding and sensitivity, post-receptor effects and chemical interactions. Pharmacodynamics and pharmacokinetics explain the effects of the drug, such as the relationship between dose and response. The pharmacological response depends on the binding of the drug to its target. The concentration of the drug at the receptor site influences its effect. The pharmacodynamics of a drug may be influenced by physiological changes due to diseases, genetic mutations, aging or other drugs. These changes are due to the ability of the disorders to modify receptor binding, to alter the amount of binding proteins, or to decrease the sensitivity of the receptor. Chemotherapy is the field of pharmacology that deals with the medicines used to treat cancer and malignancies with the help of cytotoxic and other drugs. Therapy is the branch of pharmacology specialized in the treatment of diseases and in the art and science of healing. Therefore, in pharmacology, the treatments refer to the use of drugs and their method of administration in the treatment of diseases. Clinical pharmacology promotes the rational use of drugs in humans by examining their corrective effects to increase the effect of the drug and reduce side effects. This is the pharmacology with an added emphasis on the application of pharmacological principles and methods in the real world. This ranges from the discovery of new target molecules to the effects of drug use in the population. Pharmacogenetic studies have inherited genetic differences in the metabolic pathways of drugs (and other pharmacological principles such as enzymes, messengers and receptors) that can influence drug reactions both in terms of therapeutic and undesirable effects. Pharmacognosy is the study of drugs derived from natural sources.This deal with the pharmacodynamics and the mechanisms by which substances, mainly from natural sources, directly or indirectly influence changes in living systems. Toxicology is a branch of pharmacology devoted to the scientific study of the harmful effects of drugs on living organisms. This involves observing and reporting the symptoms, mechanisms, detection and treatment of toxic substances, particularly in case of poisoning in humans. Includes environmental agents and natural chemical compounds, as well as synthesized pharmaceutical compounds for medical use. These substances can have toxic effects on living organisms, including growth disorders, discomfort, illness and death. Pharmacoepidemiology is the branch of Pharmacology that deals with the study of the use and effects of drugs in a large number of people. provides an estimate of the likelihood of a drug’s beneficial effects in a population and the likelihood of its adverse effects. This can be called a bridge science that encompasses both clinical pharmacology and epidemiology. Animal pharmacology deals with the different properties of drugs in animals. A wide variety of animals are used, including rabbits, mice, guinea pigs, etc. The drugs are administered to the animals and all the parameters (behavior, activity, vital signs, etc.) are recorded. Each change is noted below. If it is useful in animals, the drug is tested in humans. It is the branch of pharmacology and the therapies concern with determining the doses of the remedies; It is the science of dosage. For example, the usual dose of ibuprofen in adults and adolescents over 12 years is 200 mg to 400 mg three to four times a day . Pharmacoeconomics is the scientific discipline that concerns the cost and value of drugs, often with the aim of optimizing the allocation of health resources. For example, pharmacoeconomic studies can compare the costs of various drugs with results, such as the benefits for patients receiving drugs and the savings made by health systems through effective treatment or disease prevention. It is a branch of pharmacology that compares one drug to another belonging to the same group or to the other. Neuropharmacology is a branch of neuroscience that studies the effects of drugs on the nervous system, including the brain, spinal cord and nerves that carry information to and from different parts of the body. The goal of neuropharmacology in general is to understand the basic function of impulses and signals in the brain to determine the effects of drugs on the treatment of neurological disorders and dependence. Psychopharmacology is the scientific study of the effects of drugs on mood, sensation, reflection and behavior. It is distinct from neuropsychopharmacology, which focuses on the correlation between changes in drug-induced nervous system function and changes in consciousness and behavior. Cardiovascular pharmacology is the study of the effects of drugs on the entire cardiovascular system. Cardiovascular Relative to the circulatory system, which includes the heart and blood vessels, transports nutrients and oxygen to body tissues and removes carbon dioxide and other wastes. Cardiovascular diseases are disorders of the heart and blood vessels and include arteriosclerosis, coronary artery disease, heart valve, arrhythmia, arrhythmia, heart failure, hypertension, orthostatic hypotension, shock, endocarditis, diseases of the aorta and its branches, disorders of the peripheral vascular system and congenital heart disease. Please Feel free to ask any question related to this topic in the comments section. Also Like, Comment, And Share to Reach more People.